How to Transfer and Play iTunes Videos on PSP? PSP, short for PlayStation Portable, is a handheld game console made by Sony. The PSP is the only handheld video game console to use an optical disc format, Universal Media Disc (UMD), as its primary storage medium. However, it is not only a device for playing games, but also a player for music and videos. With large viewing LCD screen as its distinguished feature and 480*272 as its display pixel, PSP is no doubt a good player of videos and music for game lovers. But what video formats does PSP support? It certainly does not support M4V videos from iTunes. Because M4V videos are protected by DRM and can only be played on Apple devices. Hence, many people who use iTunes exclusively and own a PSP are concerned about how to transfer and play iTunes videos on PSP. Direct transfer gets nowhere. Only after DRM is removed from iTunes videos with iTunes Videos to PSP Converter can they be transferred and played on PSP. What can iTunes Videos to PSP Converter do for you? Tutorial: How to convert iTunes videos to AVI/MP4 format supported by PSP ? 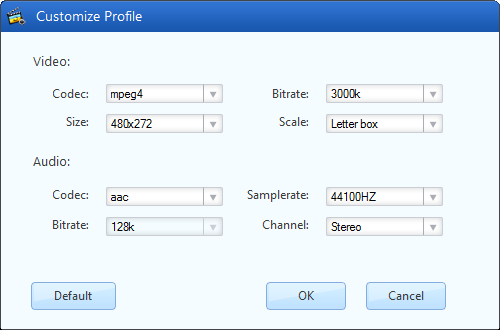 Step 3: Choose output format and set video codec and size for converting on iTunes Videos to PSP Converter. Choose on the right of the interface "Customized MP4 Video" as the output format. Then click the MP4 icon on the right of the loaded video to open dialog of "Customize Profile". Next, set video Codec to be mpeg4, Bitrate to be 3000k or higher and Size to be 480*272. As above, choose "Customized AVI Video" to be output format. Click AVI icon on the right of the loaded video to open dialog of "Customize Profile" and then set video Codec to be mjpeg, Bitrate to be 4000 or higher and Size to be 480*272. Step 4: Click "Convert" button on the bottom right interface of iTunes Videos to PSP Converter to starting converting. Do not do any operation on iTunes when the conversion is progressing in case some error may happen. Step 5: Go to the output directory above the "Convert" button to find the converted video and then transfer it to PSP via USB. Finally, enjoy this converted iTunes video on PSP ! Note: iTunes Videos to PSP Converter also supports converting iTunes videos to PSP supported audio formats such as AAC, WMA. Please go to Convert to> Output Profile> Custom settings to select "Customized AAC" or "Customized WMA Audio" as output format.